Ships tomorrow if you order in the next 23 hours 29 minutes. Auto Ship & Earn + 152 Points What's this? 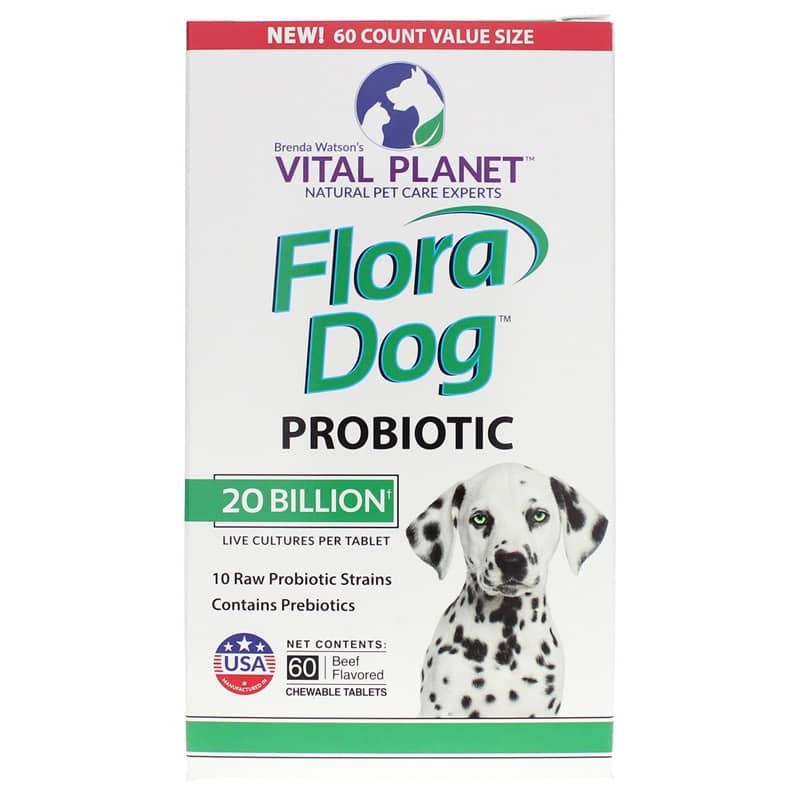 Flora Dog Probiotic for Dogs from Vital Planet is a high potency, multi-strain probiotic formula that supports digestion and promotes intestinal well-being. 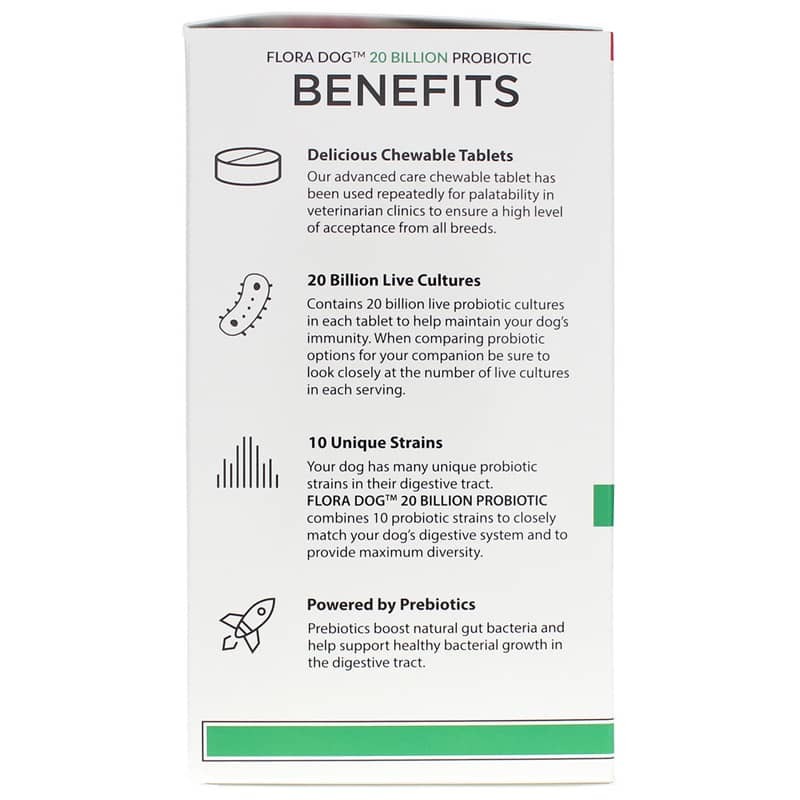 Probiotics help maintain your dog's immunity and a balanced intestinal flora. 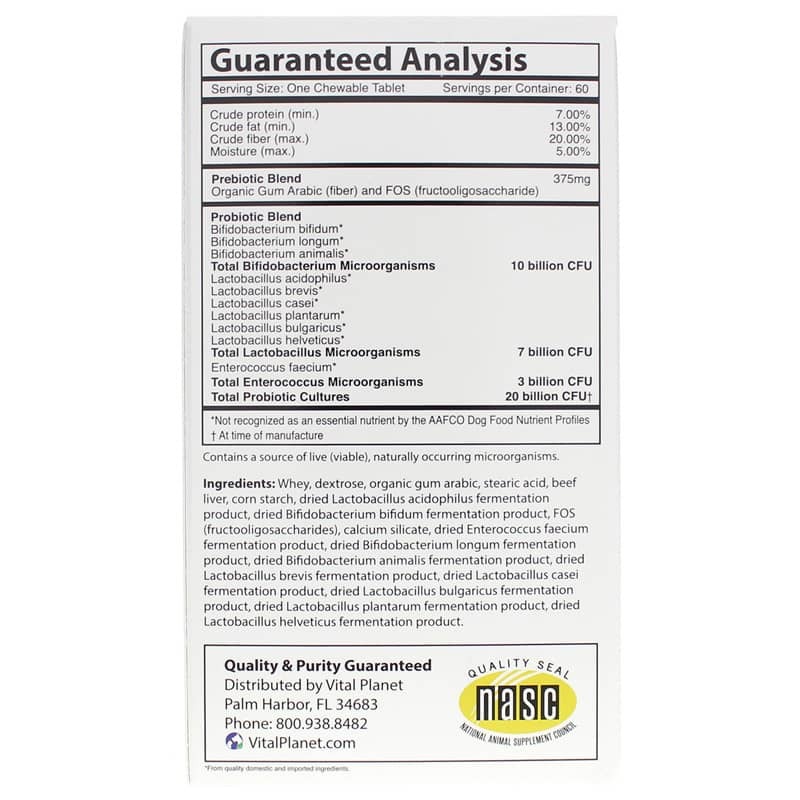 Other Ingredients: whey, dextrose, gum arabic, stearic acid, beef liver, corn starch, dried Dried Lactobacillus acidophilus fermentation product, dried Bifidobacterium bifidum fermentation product, FOS (fructooligosaccharide), calcium silicate, dried Enterococcus faecium fermentation product, dried Bifidobacterium longum dried Bifidobacterium animalis fermentation product, dried Lactobacillus brevis fermentation product, dried Lactobacillus casei fermentation product, dried Lactobacillus bulgaricus fermentation product, dried Lactobacillus plantarum fermentation product, dried Lactobacillus helveticus fermentation product. For any size dog, take one tablet daily. Tablets can be fed to your dog whole or gently crushed and added to your dog's food. Store in a cool, dry place. Best if refrigerated after opening. For animal use only. For use in canines only. Keep out of the reach of children and animals. In case of accidental overdose, contact a health professional immediately. Safe use in pregnant animals or animals intended for breeding has not been proven.